Panoramic view of Pagân, looking E. by S.
bl.uk > Online Gallery Home	> Online exhibitions	> Asia, Pacific and Africa Collections	> Panoramic view of Pagân, looking E. by S.
Watercolour in pen and ink of a panoramic view of the temples at Pagan (Bagan) in Burma (Myanmar) from 'A Series of Views in Burmah taken during Major Phayre’s Mission to the Court of Ava in 1855' by Colesworthy Grant. This album consists of 106 landscapes and portraits of Burmese and Europeans documenting the British embassy to the Burmese King, Mindon Min (reigned 1853-1878). The mission took place after the Second Anglo-Burmese War in 1852 and the annexation by the British of the Burmese province of Pegu (Bago). It was despatched by the Governor-General of India Lord Dalhousie on the instructions of the East India Company, to attempt to persuade King Mindon to sign a treaty formally acknowledging the extension of British rule over the province. The mission started out from Rangoon and travelled up the Irrawaddy (Ayeyarwady) River to the royal capital at Amarapura, stopping en route at various locations. In addition to diplomatic duties, the mission aimed to obtain accurate information about the country, culture and people of Burma, and to this end Grant was sent as official artist and Linnaeus Tripe as photographer. Grant (1813-1880) had come to India in 1832 where he lived in Calcutta and travelled to Rangoon in 1846. In recognition of his skill, he was presented with a gold cup and ruby ring by the Burmese King. Together with a privately-printed book of notes, his drawings give a vivid account of the journey and a number were used for illustrations to Henry Yule’s ‘A Narrative of the mission sent by the Governor General of India to the Court of Ava in 1855’ published in 1858. More than 5,000 stupas and temples still stand on the plain at Pagan, an abandoned city on the east bank of the river which was the royal capital of an extensive Burmese kingdom between the 11th and 13th centuries. 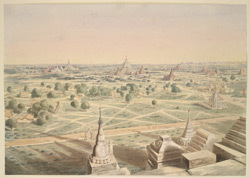 This view looking south-east is one of six panoramic views with various orientations which Grant sketched at Pagan from a vantage point from the Gawdawpalin temple. Grant stated that: 'This plate embraces a view of the most interesting of the wonder creating temples of Pagan.' He describes the Ananda temple on the left noting that it 'continues to be used, and is the most-frequented as a place of worship' and the Thatbyinnyu Pahto 'occupying the centre of the drawing'. This temple reaches a height of 61m.